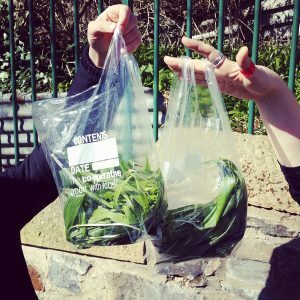 Foraging: What’s It All About? 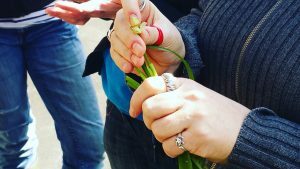 Foraging has seen a huge revival in recent years. What used to be a niche countryside pursuit is now a hobby for many city dwellers. 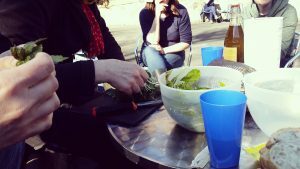 So, we sent Edinburgh Larder’s very own Chris Bennison to meet Anna Canning – a qualified medical herbalist, translator, researcher and educator – to find out more. “Foraging? 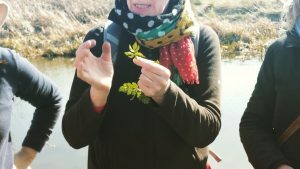 I know nothing about foraging!” But that’s exactly why I was given this blogging assignment, so that I could learn and write about being introduced. At Edinburgh Larder, we believe that food is not something created in factories and shrinkwrapped before being loaded into a lorry. Food comes from wet, windy places full of insects, dirt, and thorns. Yet, as many people pop along to their local supermarket, they’re unaware that en route, they’re walking past free produce. I met with Anna at the Water of Leith Conservation Trust’s visitor centre – a brilliantly renovated schoolhouse in Slateford 4 miles west of the city centre on the A70. She has been delivering foraging courses for a number of years and knows a huge amount about wild herbs and fruits – precious, rare knowledge in this ready meal world. 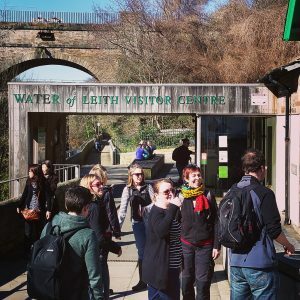 I was in the company of 8 others who’d come along to sample the Spring delights that the canalside and Water of Leith have to offer. The first point of order was the 3 R’s: rights, risks and responsibilities. Most foragers know not to take more than they need and aim to minimise their impact on the environment. Damage to trees and theft of entire plants should, of course, be prevented. But overwhelming majority of those who forage are responsible environmental stewards and know how to pick produce sustainably. 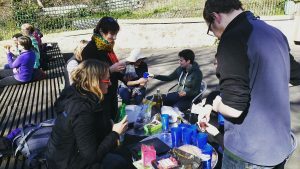 That being a given, Anna explained how foraging allows people to meaningfully reconnect with both food and the environment. 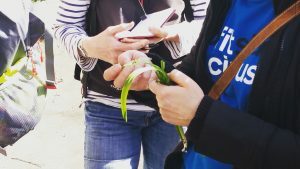 Increasingly, people want to know where their food comes from, and for those urban dwellers who don’t have the space to grow anything, foraging is arguably the best way to reconnect. 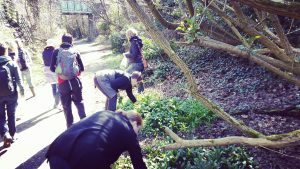 As we at Edinburgh Larder are well aware, the foraging revival is no surprise given the rise in demand for fresh and local food. But it’s not just about stuffing your face, the natural resources on our door steps have provided humans with materials for so many other things – building materials, tools, musical instruments, fibres and dyes, medicines for skin and respiratory conditions, tonics, relaxants… we were even told, for example, that boiled holly leaves were used in the past to treat malaria and the berries powdered and dried for an anti-septic. 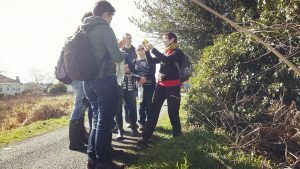 Indeed, foraging isn’t just about food, it’s about a multitude of wellbeing facets. As we walked along the waterside and woodland route, we stopped at many points of interest – spots that, in my ignorance, I’d have otherwise just breezed past. Just one example – nettles. In season between March and June before flowering (sometimes with a ‘second flush’ in October), I was surprised to learn that they are an anti-allergenic. They can be used daily to combat such aliments as hay fever. The Romans beat arthritic joints, deliberately stinging themselves, to relieve pain and inflammation. Nettles can also be used as a highly nutritious addition to stews, pesto, omelettes and soups, helping to boost our mineral intake and lower blood sugar. It was impressed on us by Anna that you should only ever take what you are confident you can identify: if in doubt, leave it out. Use a good field guide, but if you don’t have a reference book handy, you can always use a fantastic app called iSpot. 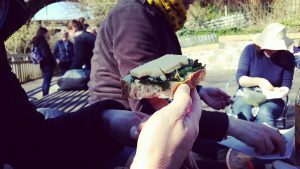 As we arrived back to the Water of Leith visitor centre with our bounty, it was all hands on deck with Anna to rustle up some scran. Using the foliage we’d acquired, a wonderful pesto was whipped up to enjoy on bread with a slice of cheese and topped with fresh tomatoes. The pesto contained nettles, stickywilly, dandelion, ground elder and lesser celandine. “Well, Anna, you’ve made a believer out of me,” I said. The sheer gratification of knowing exactly where my lunch had come from was the best part of the whole experience. Reconnecting with our environment is the only way forward. When George Michael wrote the controversial song ‘Outside’, I’m pretty sure he wasn’t singing about foraging! But music is open to interpretation, so perhaps his words “Back to nature, just human nature” can be applied in this instance. Joking aside, we are what we eat. Our bodies and minds are not nourished on chicken nuggets, that’s for sure. The way forward is to use the green resources that we have at our disposal. If not, then what’s the alternative? Check out more of Edinburgh Larder’s upcoming courses, including ‘Crusty Dutch Oven Breads’ on Saturday 22nd April. Follow Anna on Twitter and like her on Facebook.